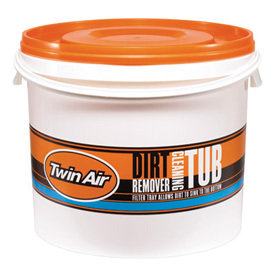 Resealable cleaning tub for cleaning air filters. Features a filter tray that lets dirt sink to the bottom. Does not include cleaning solution. I am replacing the one I bought in 2005. I think I got my moneys worth. This item makes a dirty job much better. Saves my cleaner so I can get multiple filter cleans and saves me money and clean up time. I like this kit so much, I bought two. One for cleaner, one for oil. Makes cleaning and oiling a breeze. Best system ever used. A must for frequent filter swaps. Buy two, no regrets. RMATV/MC shipping is fast. This is so convenient and much better than letting air filters soak in degreaser for hours. The rack lets dirt flow out of the filter without laying in it. Very good gift idea. it works exactly how I expected. Follow the instructions on their YouTube videos and use some common sense and it will all work out! Better than using a taller 5 gal bucket, saves space in the trailer. Does really well separating and leaving dirt in bottom. Great product from a great brand. Makes cleaning filters more convenient and a lot cleaner of a task! Pretty sweet bucket. Everything works. This is a bit expensive for a cleaning bucket, but makes filter cleaning a breeze. I use kerosene and let the filter soak for a minute or two and the cage that holds the filter down is handy. Kid snaps down really tight so you can leave cleaner in it. Handy thing keeps your filter off the bottom of the bucket. Does bucket things very well. It hold filter cleaner very well. The tight lid keeps the cleaner from evaporating. And the cages included inside keep the filter from floating, added value I wasn't aware came with it. This thing is perfect. They managed to make it perfectly round, the exact height they said it would be and the lid is a gorgeous orange color. Not quite fire orange and a little less pink than a Hawaii sunset but just right. Probably the nicest bucket I've ever bought, which it should be; it's the most expensive bucket I've ever bought. 11/10 on the bucket scale. It's an over priced plastic tub but it works very well. I like having the metal inserts to keep the filter out of the heavy sediment. And if for nothing else that makes it worth the money for the kit. This is a good product, easy to use, and made of quality material. Should last a long time. The only reason I didn't give it a 5 star is the metal tray that goes on top to keep filter submerged is very temperamental in that it doesn't like to stay in place other than at the very top. I don't want to fill the tub that high because its just a waste, so at this time I don't use the metal tray on top, but I do use the bottom filter tray. works great! like the filter rack saves money. I clean lots of filters so it is good to save money. I actually use No Toil cleaning and oiling products and this tub works great for cleaning all of our air filters. Love the rack on the bottom that lets the heavy dirt fall down to the bottom and separate from the wash, as well as the second rack that sits on top that allows the filters to drip dry. Works perfect , stays clean. Keeps everything nice and neat and organized!! Also purchased the oil tub to. Great idea! The bucket is a great idea to clean air filters..
sadly yet again its just a bucket , but it does come with some nice aluminium Spiders (i dont know what the proper name for them are ) . one is used to hold the filter off the bottom where the dirt and grime collect and the other to hold the filter submerged in your solution to soak. Worked well at first. After 3 months of use the wire insert that is supposed to hold the filter down under the cleaner will not stay down. It keeps popping up in the tub allowing the filter to float instead of being kept under the cleaner as designed. Also the lid has cracked in several places allowing the smell of the cleaner to permeate the air in work area. The idea of the product is great, but it just doesn't work. Nice cleaning tub. Works better than the old bucket I used to use. Plus I store my old used filters in it until they are all dirty then I wash them all at once. The best for cleaning your nasty air filter! Now I have a place to clean the filters. Works great to let the filter soak if needed too. Works great...seems expensive, but better than using a bucket or coming up with your own design. It was worth the premium price to me. Alittl smaill for my filter but still works very well. A big tub for cleaning your air filter. This is a big tub to store your air filter cleaner in. Is it worth the money, I would say yes as it is very durable and there is a metal grate type thing in the bottom to prevent your filter from touching the dirt that has accumulated at the bottom of the tub. <br>An update, if you don't open this tub up for a while it will look like it is imploding. i bought two one for cleaning, one for spraying after, all my filter are dirty i clean them all at once to save on chemicals, and i store the clean ones in one of the tubs until its time to ride, i spray sum oil on one filter and go. the rest are clean waiting on the next ride. I bought this to use to oil my filters, so I always have a oiled filter ready to go on the bike and not have to wait while I clean the one on the bike. It holds a ton, as I dumped in roughly 12 bottles of filter oil and the cage sits high enough to allow all the excess to run into the bottom and the filter is ready to go at that point. The best. I used others. Does the bucket kit come with two of the wire "screen/rack" doo-hickies? Pictures I've seen show one orange one on the bottom of the bucket and a black one that suspends near the top of the bucket. It's been a while since I've purchased, but it ones with a SINGLE black one. In my experience, it's used to hold the filter down into the bottom of the bucket and into the solvent. Without it, they want to naturally float to the top, leaving some of the filter exposed. How much cleaning solution do you need to put in it to make it work right? BEST ANSWER: Enough so that you can fully submerge the filter. I cannot remember how much this was. 1/2 the capacity is about where I keep it leveled. What size is the tub? BEST ANSWER: It is a 2 1/2 gallon tub.